Looking for the Prism for the Windows Runtime templates for Windows 8.1? Then clickhere. Note: While Prism for the Windows Runtime is a patterns & practices release, these templates are not. They've been created in my spare time, and if you have any issues with them, or suggestions for future development, please contactme. Together the libraries accelerate development of apps by providing support for MVVM, loosely coupled communication, and the core services required in Windows Store apps. For more info about Prism for the Windows Runtime see Developing a Windows Store business app using C#, XAML, and Prism for the Windows Runtime and thePrism for the Windows Runtime codeplex site. Prism App: a single-page project for a Windows Store app that uses Prism for the Windows Runtime. 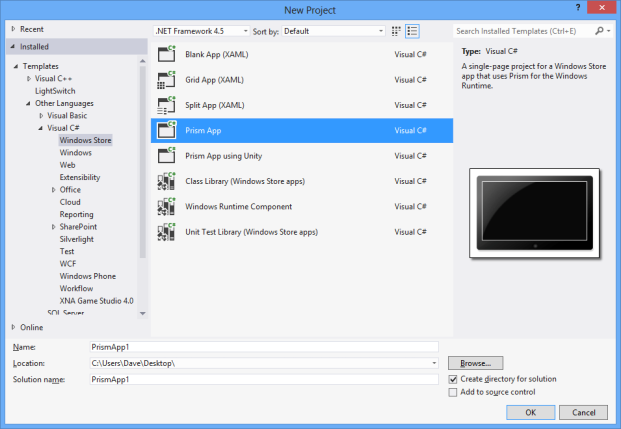 Prism App using Unity: a single-page project for a Windows Store app that uses Prism for the Windows Runtime and the Unity dependency injection container. Each project template creates a Windows Store app project that includes a reference to the Prism.StoreApps library, a view (MainPage), a corresponding view model (MainPageViewModel), and an App class that bootstraps the app using the Prism.StoreApps library. In addition, the Prism App using Unity project template creates a Windows Store app project that also includes a reference to the Unity library, and bootstraps the app using the Unity dependency injection container. Page View (Prism): A minimal page view with layout awareness, a title, and a back button control, for a Prism app. View Model (Prism): A view model class for a Prism app. Model (Prism): A model class, with validation support, for a Prism app. PubSubEvent (Prism): A loosely coupled event for a Prism app. Flyout View (Prism): A Flyout view for a Prism app. 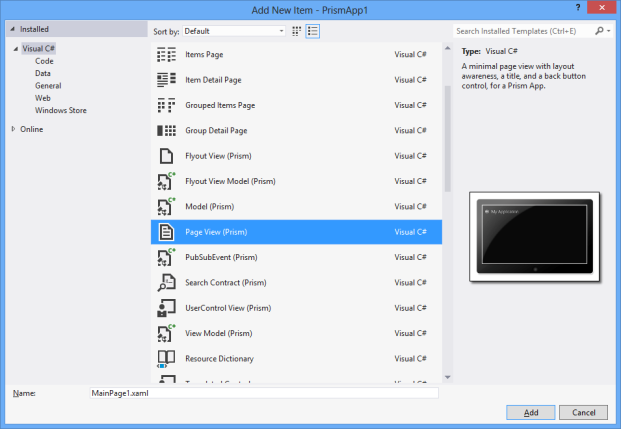 Flyout View Model (Prism): A Flyout view model class for a Prism app. UserControl View (Prism): A blank UserControl view for a Prism app. Search Contract (Prism): A Prism app contract that supports displaying search results. Each item template creates a class that derives from the correct type in the Prism.StoreApps library. In addition, the PubSubEvent (Prism) item template adds a reference to the Prism.PubSubEvents library to the project. Please note that these item templates will only work with an app created from one of the Prism app project templates. It adds a SearchResults page to the project. It adds the OnSearchApplication method override to the App class. It adds the Search declaration to the package manifest.